Super villa with garden and private swimming pool in an elevated setting with beautiful views over Javea and the sea. 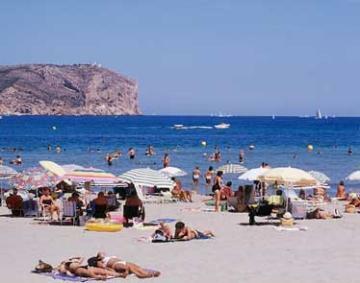 Located in the Costa Nova Panorama area of Javea, 4km from the main El Arenal beach. Shops and restaurant 2km. Golf and tennis 5km. Denia 10km. Valencia airport 118km. Alicante airport 87km. The accommodation is all on the ground floor (the upper floor is closed and not in use) and comprises a living room with television and DVD player. Dining room and fully equipped kitchen. Double bedroom (1 x 140cm wide bed) and a twin bedroom (2 x 90cm wide beds). Bathroom. The garden is a good size, there are lawned areas and a delightful pool terrace complemented by a barbeque and bar. Refundable deposit €300 payable locally by credit card slip, euro cheque or cash. Obligatory final clean payable locally 95€. Linen supplied at 12 euros per kit (per person) payable locally. Each kit comprises bed linen, 1 shower towel, 1 hand towel, 1 dishcloth per person. Heating for the house (if used). Additional services (where available) including cleaning, babysitting and catering. Pet supplement of €60 per stay per animal where they are allowed, as stated in the property description. Extra beds or person supplement of €70 per bed per week. Cot and/or high chair available for hire on request 50€ per week payable locally. Pet supplement 50€. Internet key 45€ per week.